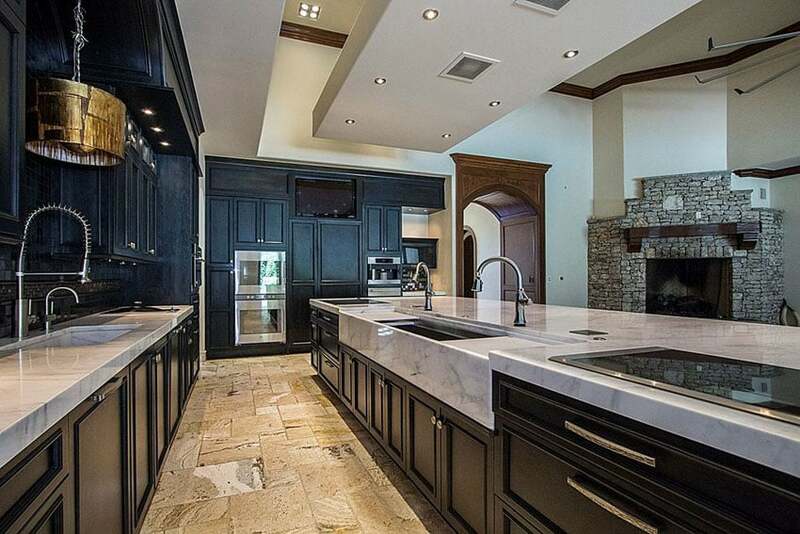 This gallery showcases beautiful luxury kitchens with dark cabinets. 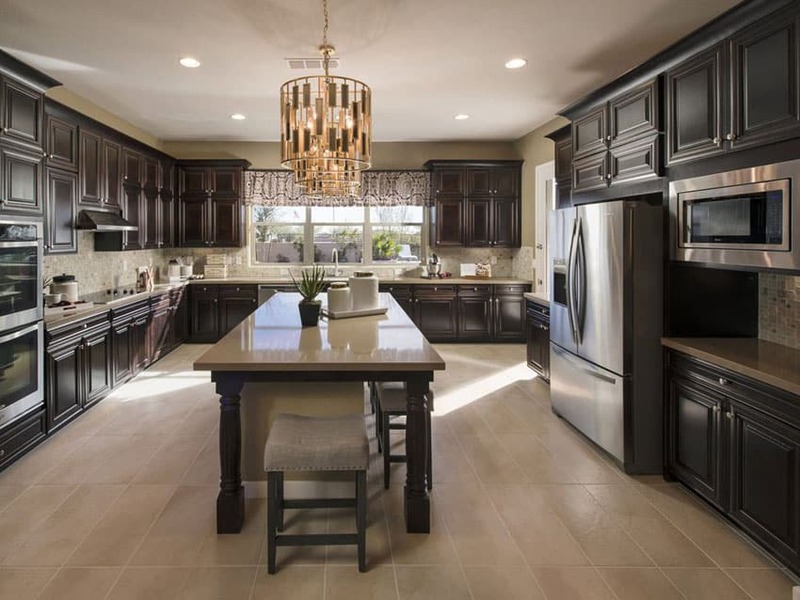 Dark kitchen cabinets are stunning when paired with lighter design elements such as flooring and countertops. Natural and indoor lighting play a huge part in keeping the right balance between light and dark. 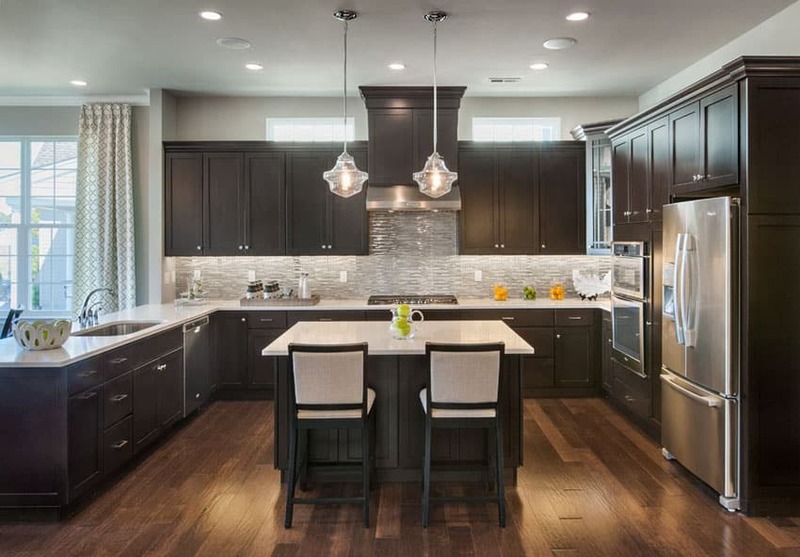 Below are ways top interior designers are using different shades of deep hues from medium brown to black to create an alluring kitchen space. The Eclecticism of the kitchen in the picture above is apparent in its centerpiece pendant lamp over the round kitchen bench, with multiple teardrop filament bulbs. The horizontal striped textiles also lend a quirky edge, and match with the powder blue glass backsplash and stainless steel appliances. The kitchen is matured with its black paneled cabinets topped with white Atlantic Salt quartz countertops and natural wooden strip flooring. 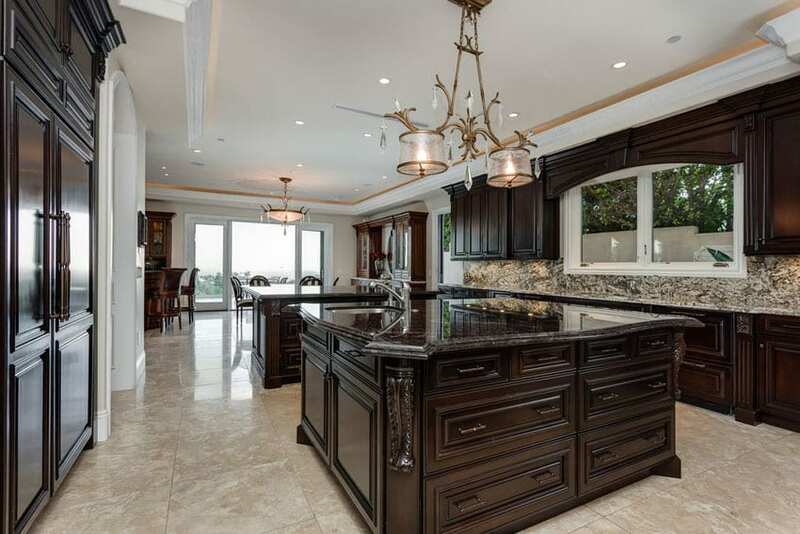 With a Modern candelabra over the dining table and triple silver pendant lamps over the kitchen bench, this kitchen’s dark cabinets emphasize the Contemporary rustic feel. The patterned grey carpet for the dining table and upholstered leather dining seats and bar stools further emphasize Modernity, while the stone tiled flooring for the kitchen lends a rustic vibe. The genteel double-lampshade chandelier with hanging crystals add a Georgian aesthetic, as do the black polished wood paneled cabinets and drawers and black granite countertop, held up by intricate wooden brackets. The busy marble backsplash speckled with brown, gray and white is contrasted by the linearity of the picture window with paneled wooden curtain cove. The square cut stone tile flooring also adds to the classic Georgian vibe of this kitchen. 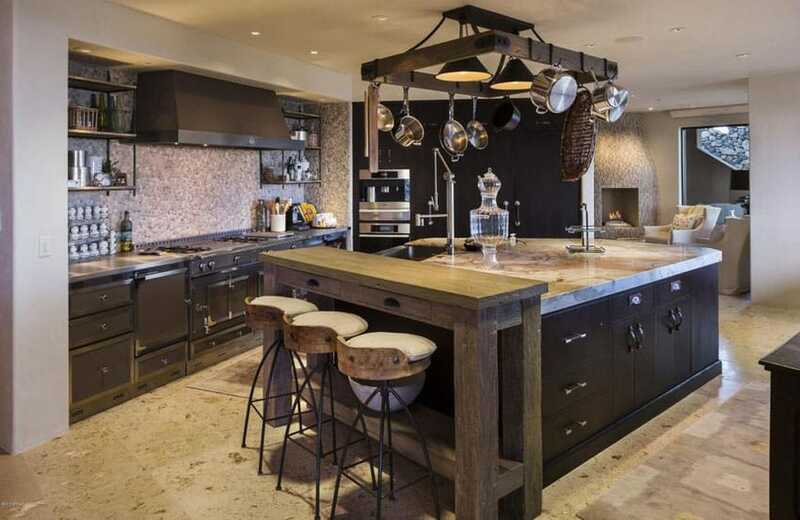 This kitchen screams Rustic with its use of reclaimed wood for the bar stools and heavy breakfast nook, as well as the addition of a quirky pot hanger over the kitchen island, framing the two black iron industrial hanging lamps. Lending some Contemporary elements to this design are the plain dark wood cabinetry and hanging open shelves, as well as the grey and white mosaic tile backsplash. The sandstone tiled floors call back to the Rustic vibe, and contrast with the open concept living area with fireplace at the end wall. 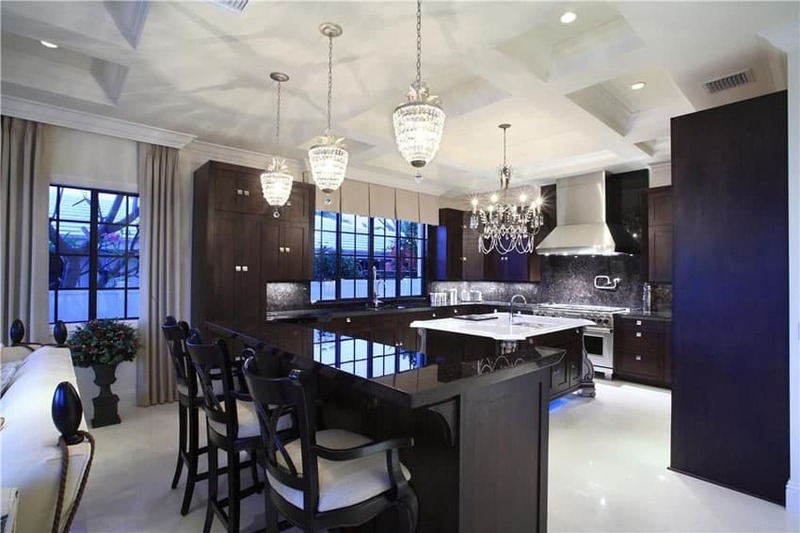 The twin pendant lamps over the kitchen bench are almost Georgian in style and are emphasized by all black paneled cabinets and casework topped with light travertine countertops. The exposed wooden beams on the ceiling and heavy upholstered seats lend to this classic look, while the stainless steel furniture, stone subway tile backsplash and light limestone flooring give it a more modern appeal. Clerestory windows above the hanging cabinets bring in light to this otherwise darker kitchen. An exaggerated wood-framed architrave through the main hallway leads into the limestone-tiled kitchen, opposed by a rubble stone fireplace on the far side with wooden plate rail. 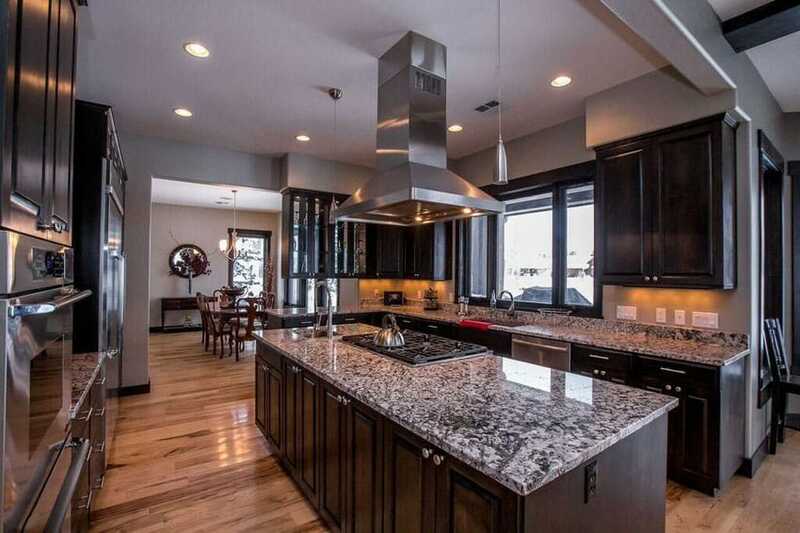 Black paneled kitchen cabinets and drawers are topped with Carrara marble countertops and stainless steel appliances. The stove top is emphasized by 3 small spotlights, and the wash basin is given a rustic feel by the gold drum pendant lamp over it. 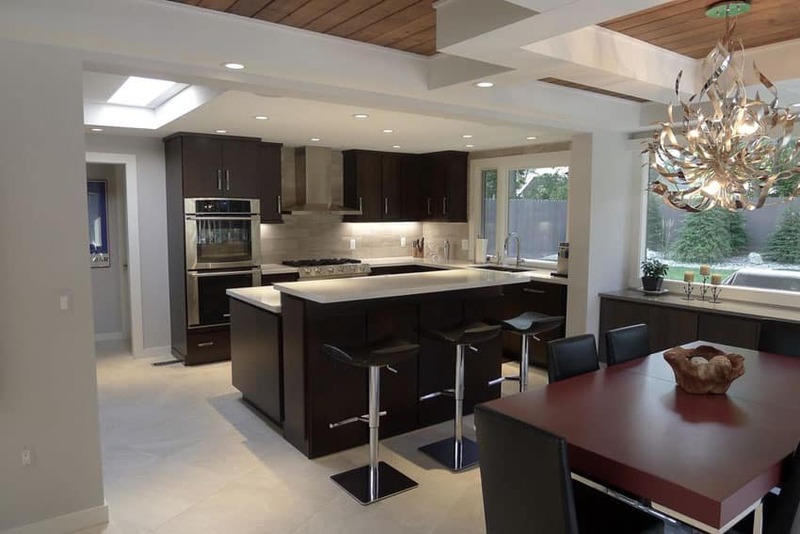 The classic iteration of these elements is contrasted by the Modernistic drop ceiling over the kitchen bench, with its clean lines and subdued downlighting. The backsplash featuring small strips of different shades of natural stone look busy and transitional, but is toned down perfectly by the dark wooden cabinets and drawers, mixed in with stainless steel wine chiller, refrigerator, microwave and stovetop and range hood flushed perfectly with the casework. The kitchen counter stands out with its cool white body and pale stone countertop matched with stainless steel wash basin. The coarse-grained stone tile flooring also adds to the cool tones of the kitchen and is matched by the organic-pattern rug of the dining table. 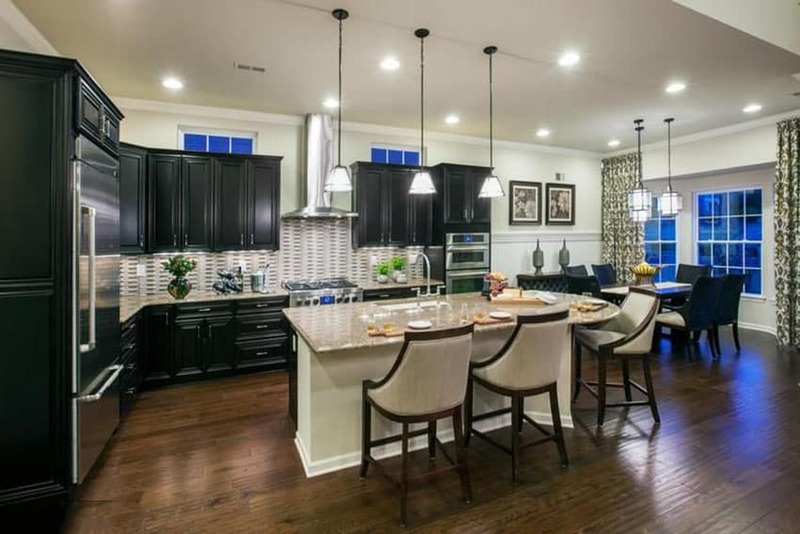 The double pendant lamps over the countertop completely tie the look together. Simplicity is key in this kitchen, where flushed profile dark wood cabinets are matched with pristine white countertops and linear silver handles. 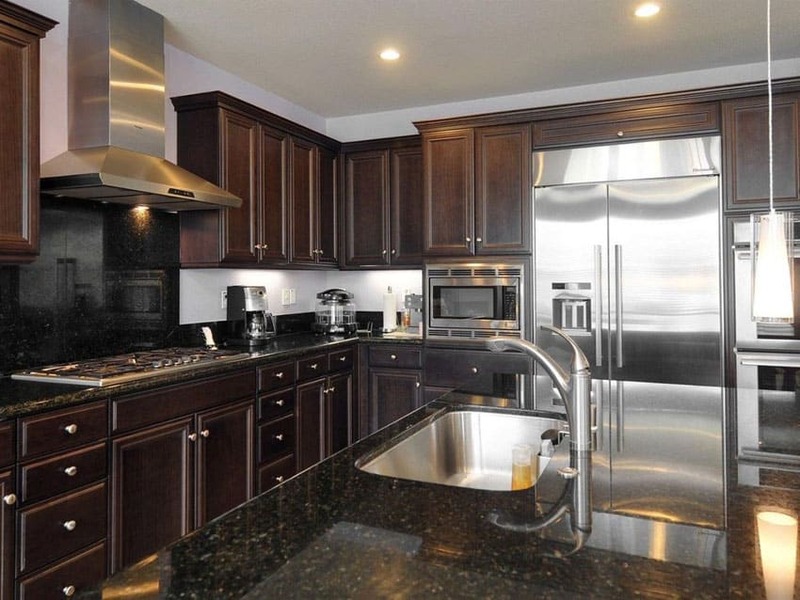 Stainless steel appliances such as the ref, oven, stovetop and range hood look seamless, flushed down to the casework. The linear-grained stone tile for the backsplash add to the Contemporary cool feel of this kitchen. 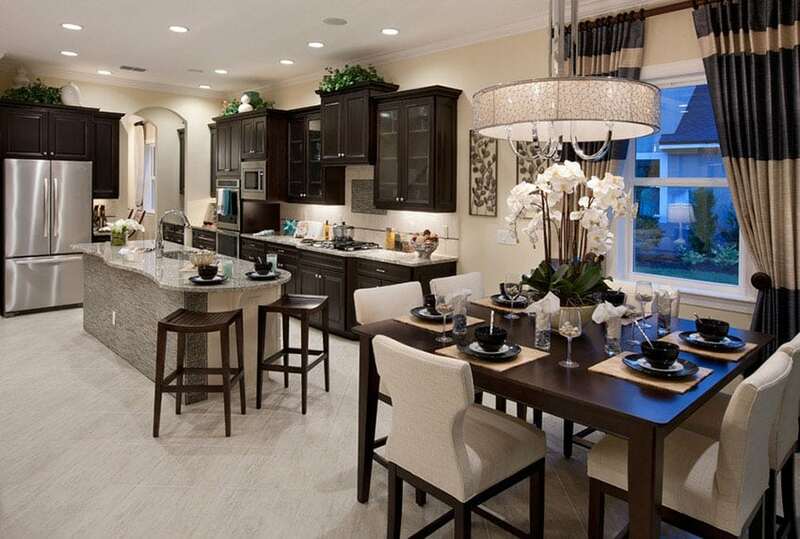 Kitchens with dark cabinets are often paired with white countertops to give a pleasing contrast that home owners love. Unfinished concrete ceilings are the perfect combination to this dark kitchen’s large drawers in dark wood, and matching frosted class aluminum-framed cabinet, mixing industrial with luxe. 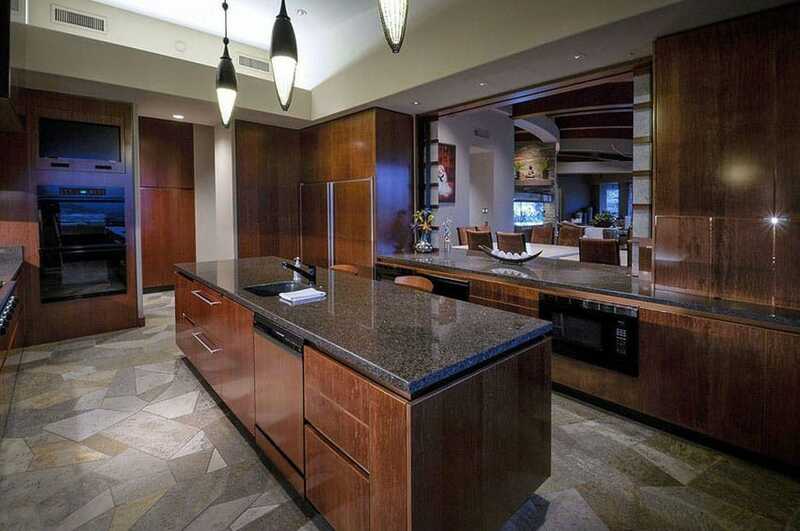 The dark wooden casework is topped by dark emperador marble countertops, and are flushed in with modern stainless steel appliances. A large picture window leading out to the balcony, with walls also in unfinished concrete and overlooking the skyline lend to the industrial feel. A light color backsplash can really help lighten up kitchens with dark cabinets. The dark cabinets topped with dark emperador marble countertops are contrasted by the backsplash in small strips of light marble in pale whites and greys mixed with light brown and orange. 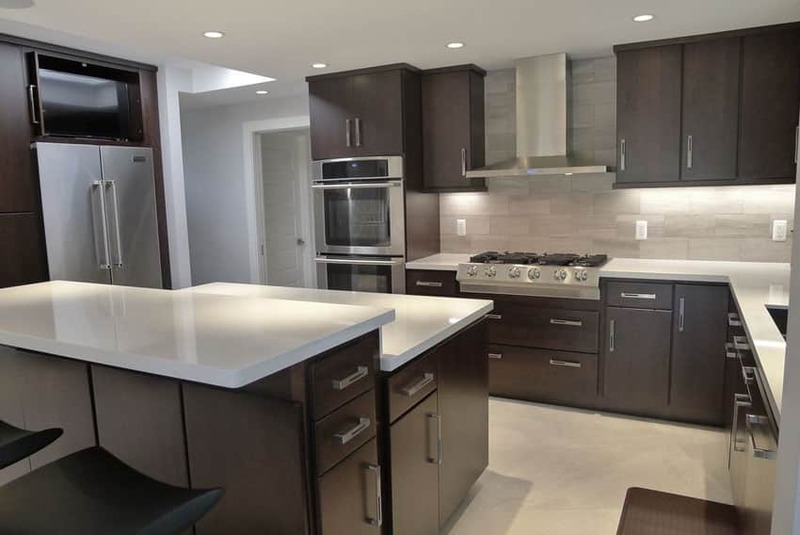 Frosted glass cabinets in aluminum framing provide a relief to the busy colors and textures of stone and wood, as does the stainless steel five burner gas stove and range hood. 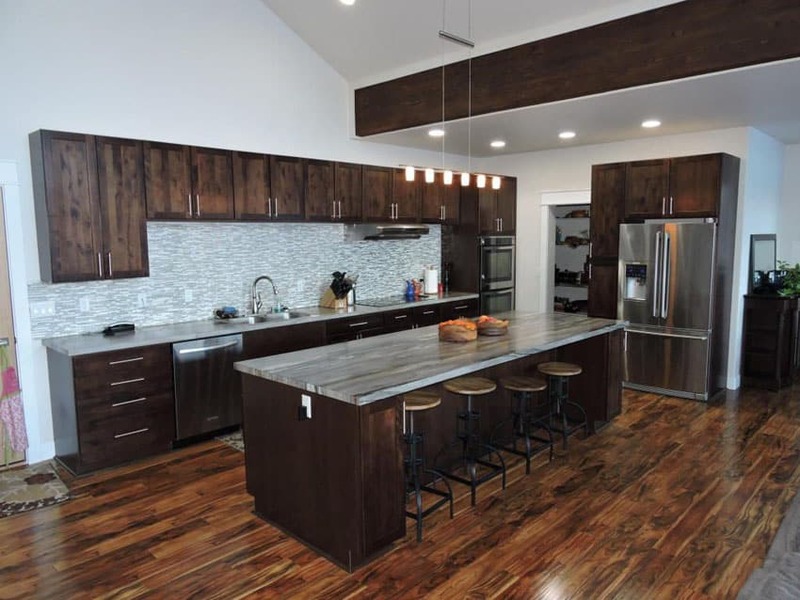 An interesting mix of colors on the granite countertop is emphasized by the subdued rustic brown nosing and dark walnut wooden plinth and cabinets, with even the refrigerator doors following the natural wooden finish. A galvanized iron finish beneath the kitchen island lends an industrial feel for this kitchen, as does the black painted overhead shelves. The clean lines of the basket weave backsplash and silver linear pendants streamline this industrial style kitchen. 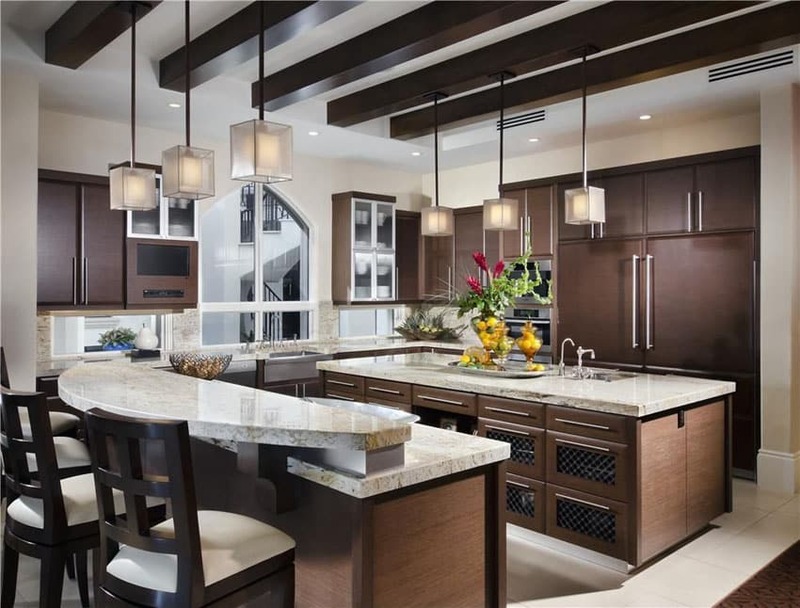 The linear value of dark wood strip flooring flowing from the dining room to the double-loaded or galley style kitchen is emphasized by its drop ceiling and rough stone-clad columns. The kitchen itself is fitted with plain dark wood cabinets with barely-there hardware handles and stainless steel countertops and appliances. 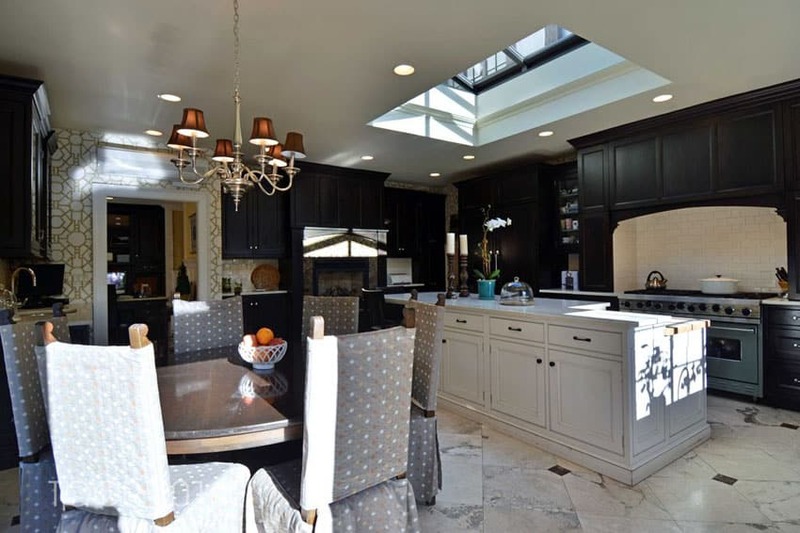 A mirror and lampshade to the side adds a hominess to the dark, clean lines of the kitchen. The circular sunlight cut-out and curved drop ceiling with blue cove lights lend a very Futuristic feel to this kitchen and dining room setting. 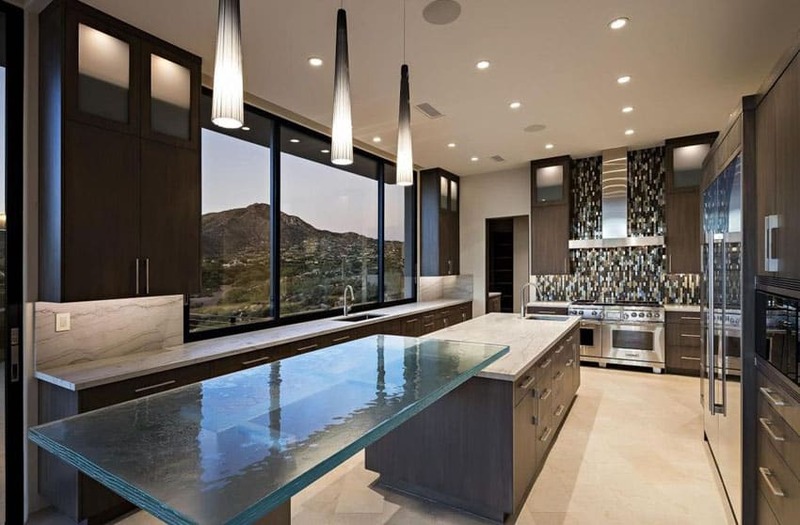 With 2 large picture windows facing the mountains outside, the outdoors are brought in with this kitchen’s dark wood grain cabinets and caseworks and black granite countertop. The floors also echo the mountainside with its light travertine tiling, as does the backsplash in varying small cuts of grey and white stone. 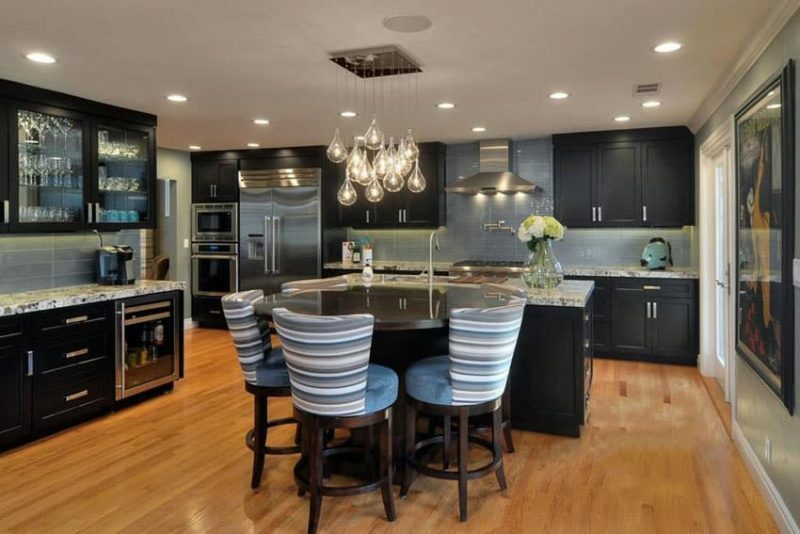 Lancet-shaped black pendant lamps over the dark honed granite countertop match with the warm wood-grained cabinets and black aluminum appliances recessed into the casework. The random-cut stone floor tiles lend an air of lodge cabin living, while a large mirror emphasized by three small spotlights makes this kitchen a more contemporary functional space. The lightness of the glass-topped breakfast nook is matched by the three small cone-shaped pendant lamps over it, and contrasted by the kitchen island attached, made of grey marble countertop and massive grey wood cabinetry. The grey marble and grey wood elements are echoed in the surrounding overhead cabinets and backsplash, which frames a large picture window framing the mountains. The varied stone backsplash behind the range hood adds a pop of color to this Contemporary classic kitchen. Knotted wood panel cabinets and drawers are topped with large grey and orange veined marble countertops. The wood and iron barstools, vaulted ceiling and heavy-grained Mazama wood flooring add to the industrial feel of this kitchen. On the other hand, the stainless steel appliances, thin white and grey backsplash and lithe six-bulb pendant lamp give this industrial kitchen some clean, light lines. Dark stone tiles in chevron pattern provide the base to this kitchen, with a view of the outdoors through its modern-style French doors. Calacatta marble countertops feature a white lightness atop the heavy black painted kitchen island, while the undercounter and hanging cabinets are finished with a grainier dark wood. The dark colors in this room are contrasted by the white recessed ceiling above the kitchen and the white subway tile backsplash. Two spun glass pendant lamps hang over the white Arctic quartz stone countertop of the dark paneled wood kitchen island, completed with two off-white upholstered dark wood bar stools. The rest of the kitchen is also fitted with dark wood paneled undercounter drawers and hanging cabinets, and stainless steel appliances. Lightness is brought in to the space with clerestory windows over the hanging cabinets, echoed by the small grey tile strip backsplash. Natural stone tiles with linear grain contrast with the solid black panel cabinets topped with solid white stone countertop. Stainless steel appliances are recessed into the casework, and are supported by the mosaic tile backsplash in bands of white and grey speckles and solid black. An oiled metal chandelier over the dining table with green plant accents completes the look of this Contemporary classic kitchen. Three crystal pendant lamps hang over the breakfast nook, made up of slid dark wood base and solid black polished stone countertop. The crystal chandelier over the kitchen island matches the pendant lamps while the white polished Carrara marble countertop contrasts the black of the breakfast nook. Black framed mullioned windows and white coffered ceilings lend a linear aspect to the Georgian lines of the lights and paneled cabinets, as do the stainless steel appliances and grey mosaic tile backsplash. A grey long-haired rug by the wash basin provides a change in texture over the solid wood flooring that matches with the dark paneled wood cabinets and casework. 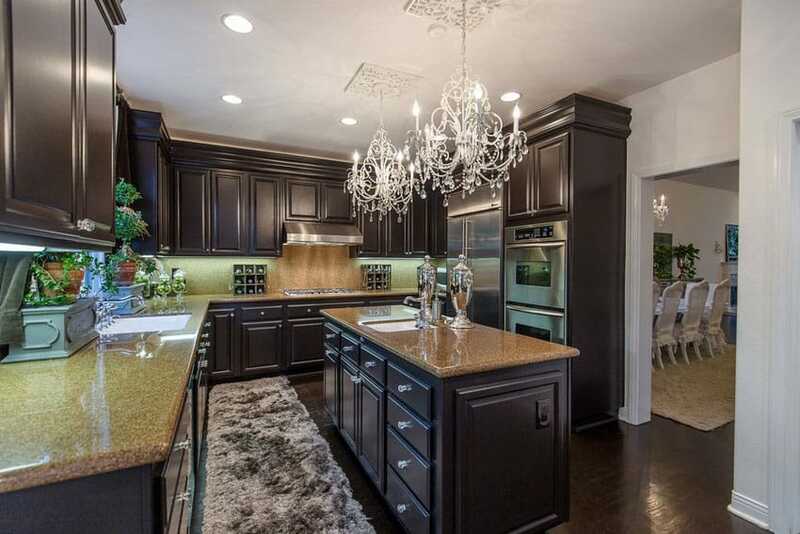 Topped with classic style black speckled brown stone polished countertops, this kitchen goes for the more old school look, and is emphasized by the dainty crystal chandelier with square ceiling rosettes. The Gatsby-esque gold line wallpaper and vaulted skylight over the kitchen bench give an Old Hollywood glamour to this kitchen. The dark paneled wood cabinets, particularly the paneled framing over the recessed stove top provide a dark contrast to the white painted wood kitchen island topped with white polished stone countertop, as well as the white subway tile backsplash running behind the stove top. Marble tiled flooring inlaid with diamond-shaped corners add to more of the Old Hollywood glamour, as does the orange lampshade chandelier over the dining table. With its open concept, the deep blue hue of the couch is a brilliant accent to the subdued tones of the kitchen, and is joined together with warm, hickory wood strip flooring. 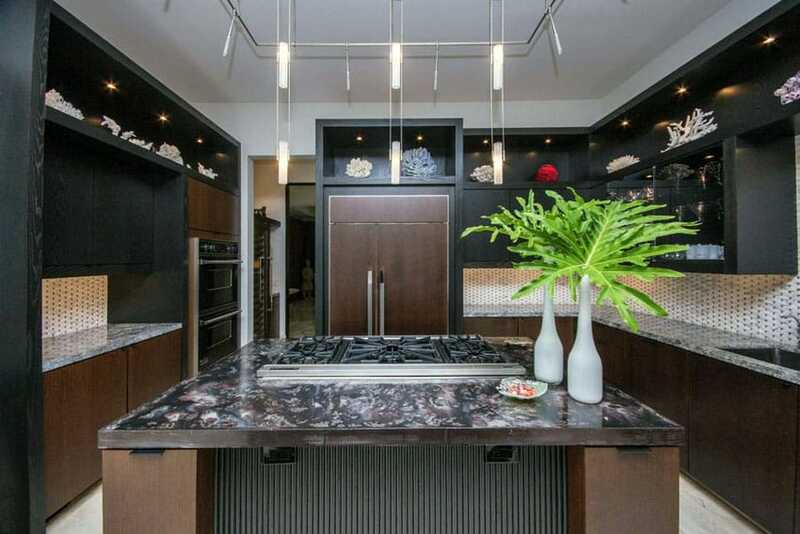 The black painted wood cabinets, and casework blend seamlessly with the recessed stainless steel appliances and is topped with a light brown marble countertop. The linear beige tile backsplash running all along the back wall is disrupted by the vertical setting of grey mosaic strips over the stove top and range hood, drawing attention to this area. 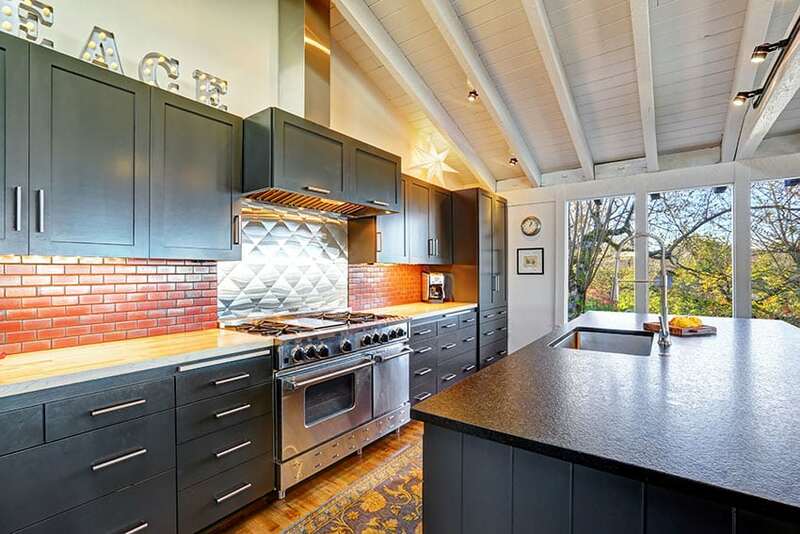 Black paneled undercounter drawers and hanging cabinets match with the plain white walls and white mullioned windows looking out into the garden. The countertops are finished with polished beige stone, and the kitchen island provides a contrast with its curved end and white wooden plinth. Warm wood plank flooring add to the warmth of this L-shaped kitchen, while the clerestory windows above the cabinets and grey and white tile strip backsplash add to the light and linearity of the space. Modern square downlights in trios hang from the polished wooden ceiling beams giving the kitchen a Contemporary barn feel. The lighter wood choice for the cabinets and casework provide a light accent to the grey-veined Bianco Romano marble countertops, with the slab over the breakfast nook doing a slight half-moon curve. A slanted picture window over the wash basin adds to the marriage of Contemporary and Barn elements, as do the frosted glass hanging cabinets encased in the warm wood casework. 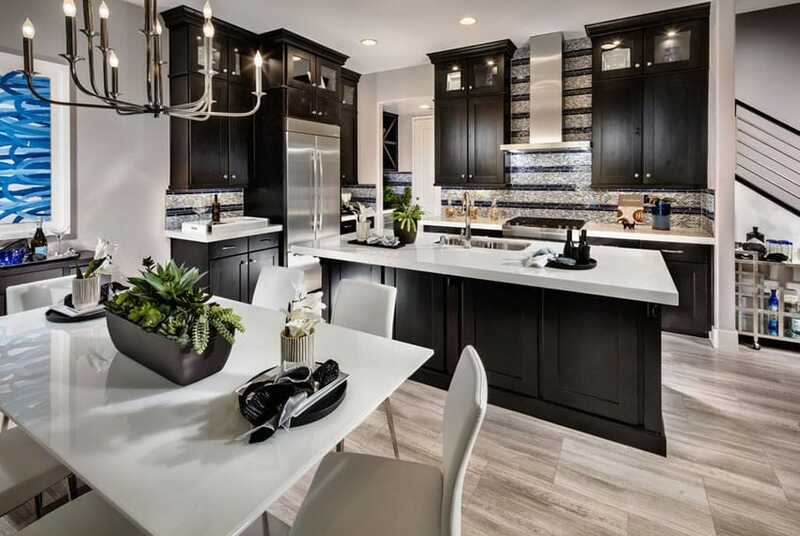 Speckled black and white granite countertops and Calacatta marble strip tile flooring are busy materials to be working with, but the smooth black paneled cabinets and stainless steel appliances and pendant lamps provide a sleek accent to these finishes. 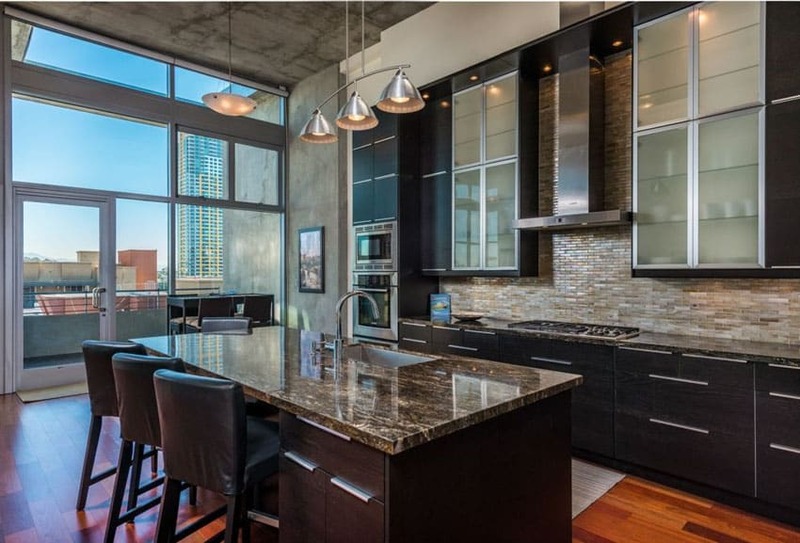 A large picture window above the wash basin is framed in black aluminum and its clean lines contrasts with the busy finishes used for the flooring and countertop. The intricate gold chandelier provides the room’s focal point, hanging over the kitchen island, a white slab of polished natural quartz stone rendered light with its wooden pedestals on all four sides. 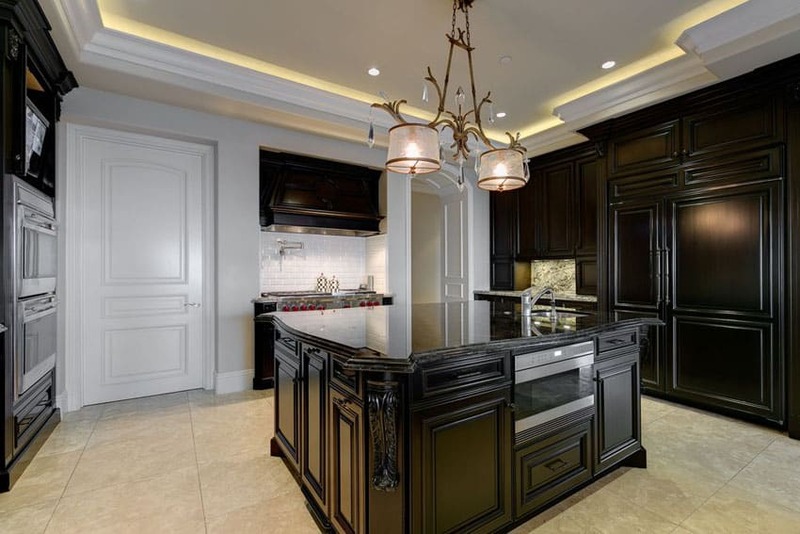 Black paneled kitchen cabinets in a matte sheen highlight the centerpiece and are inlaid with stainless steel appliances and white and grey mosaic tile backsplash. The linear travertine floor tiles running all along the kitchen floor tie the whole look together, creating clean modern lines in the Georgian style of chandelier and cabinet paneling. The cross-hatched backsplash over the Italian cream polished stone countertops are given a Futuristic vibe with the blue light hidden under the hanging cabinet’s pelmet. 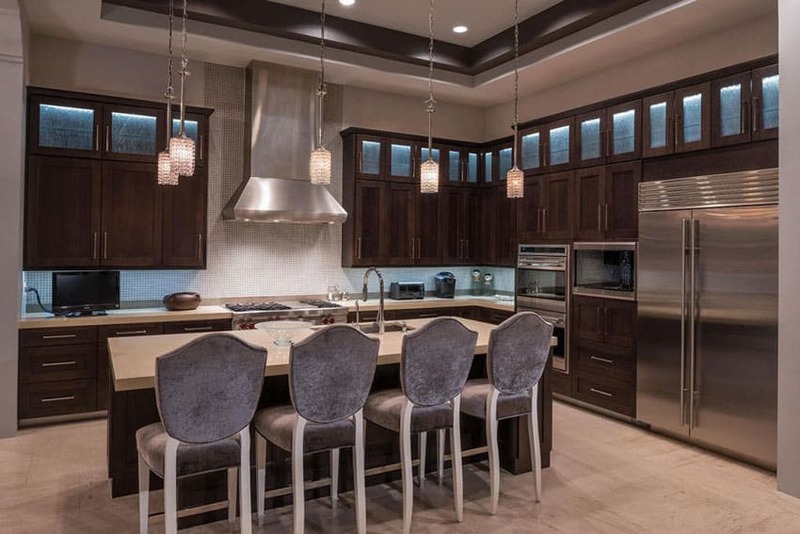 The blue light them continues above the dark paneled cabinet doors and are echoed by the space gray upholstered chairs by the kitchen bench. Stainless steel appliances emphasize this futuristic theme, while the linear travertine tiles provide a natural finish. Metal wire encased filament lamps or Edison bulbs add a rustic vibe to an otherwise Modern kitchen. 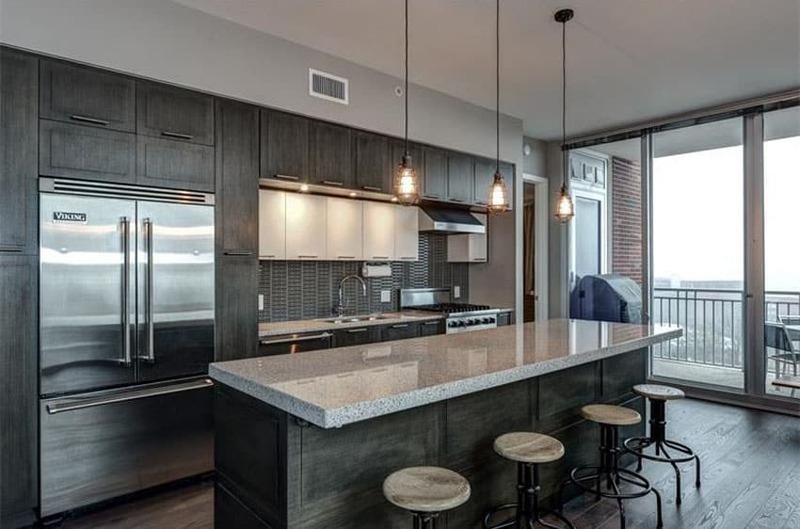 The grey wood grain of the cabinets and caseworks, as well as the wooden strip flooring and grey wood and black iron stools add to the rustic vibe, while the dark grey linear backsplash, stainless steel Viking appliances, and floor to ceiling sliding doors leading out to the balcony add the Modern vibe. The genteel double-lampshade chandelier with hanging crystals add a Georgian aesthetic, as do the black polished wood paneled cabinets and drawers and dark emperador marble countertop, held up by intricate wooden brackets. The busy marble backsplash speckled with brown, gray and white is contrasted by the linearity of the picture window with paneled wooden curtain cove. The square cut stone tile flooring also adds to the classic Georgian vibe of this kitchen. 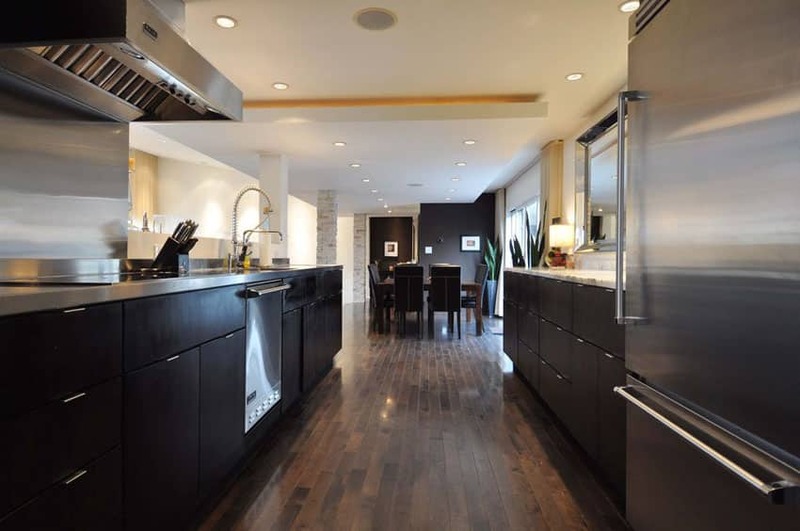 Plain flushed black wooden cabinets and drawers paired with linear silver handles give this kitchen a Contemporary vibe, alongside its stainless steel appliances recessed into the casework and metallic silver and black barstools. The grey and white glass mosaic tile backsplash and grey polished stone countertops add variety to the linear qualities of the space. 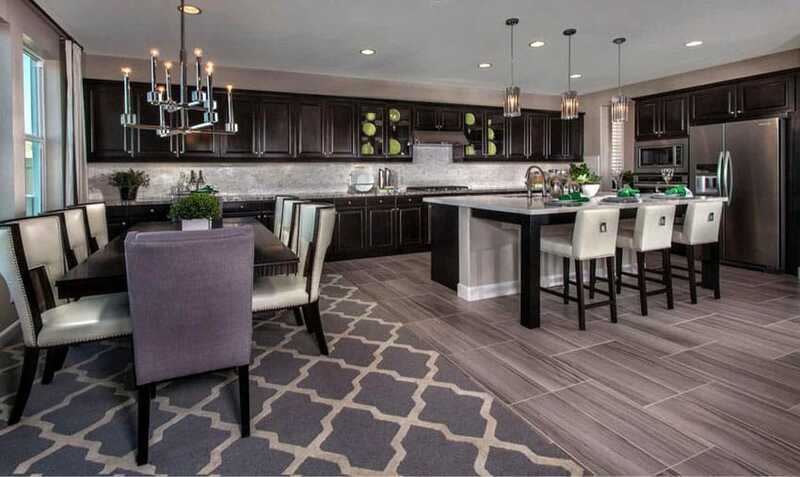 The travertine tiled flooring ties together the entire black and white look with its neutral tones. White coffered ceilings are given life with warm wood paneling on its recessed areas, and are contrasted with the highly Futuristic sculptural aluminum centerpiece pendant lamp over the dining table. 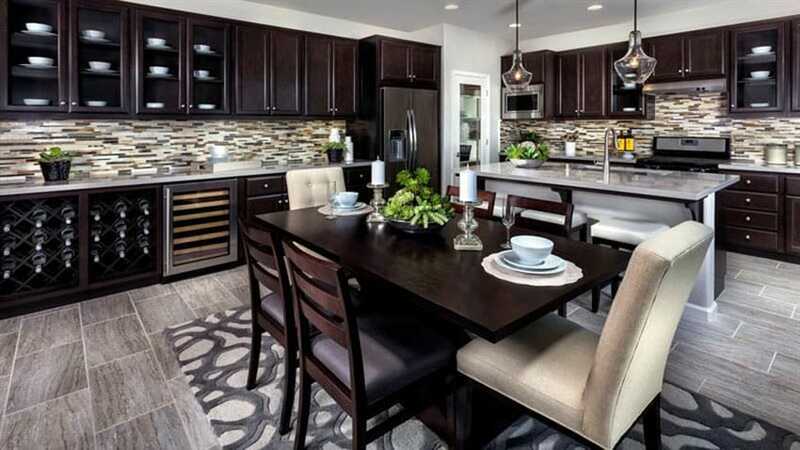 The black upholstered dining table seats are echoed in the taller, slimmer bar stools, which face a double level kitchen bench of flushed black polished wood topped with clean white countertops. A lot of light is brought into the space with the large picture windows and skylight over the side walkway of the kitchen. The linear grained stone tile backsplash and travertine floor tiles complete the look of this Contemporary kitchen. 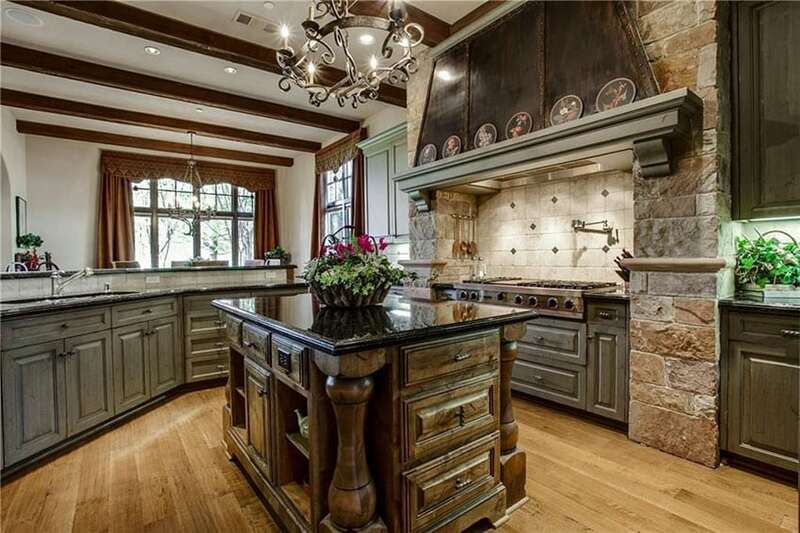 This kitchen screams Rustic with its unpolished river stone finished back wall. Adding to its rustic charm are the cabinets in a dark wood grain with deep lines, exposed beams running along the ceiling, as well as the rusted metal panel with rivets over the kitchen range hood, supported by a classic plate rail and cornice brackets. A wrought iron candelabra hangs over the kitchen island with its black glossy stone countertop held up by solid wood plinth and column. The strip wood flooring is in a lighter shade, allowing the other darker elements to stand out in the scene. 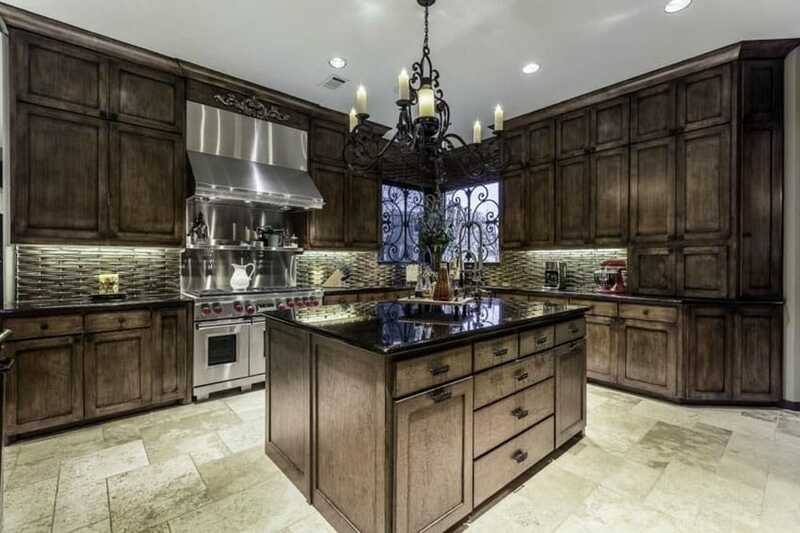 The wrought iron candelabra and grey washed paneled wooden cabinetry lend this kitchen a Southern Gothic vibe. This style is further emphasized by the wrought iron grilles by the windows and the crown molding over the stainless steel stove and range hood. Polished black stone countertops and grey basket weave backsplash lit with pelmet lighting add linear accents; while the grey hewn travertine stone tile flooring complete this kitchen’s Contemporary Gothic look. 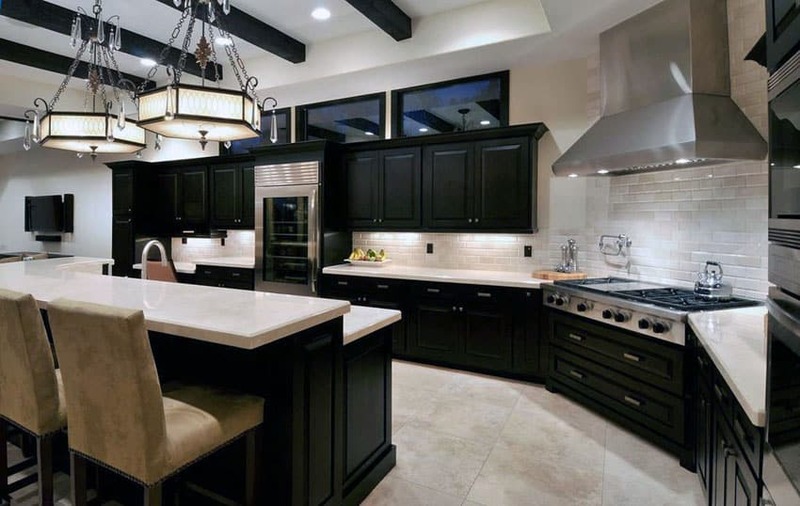 Kitchens with dark cabinets can tend to look dim unless contrasted with lighter countertops, ceiling, lighting or flooring. This kitchen benefits from a lot of natural light that is paired with the painted white vaulted ceiling to give this room a lighter feel. 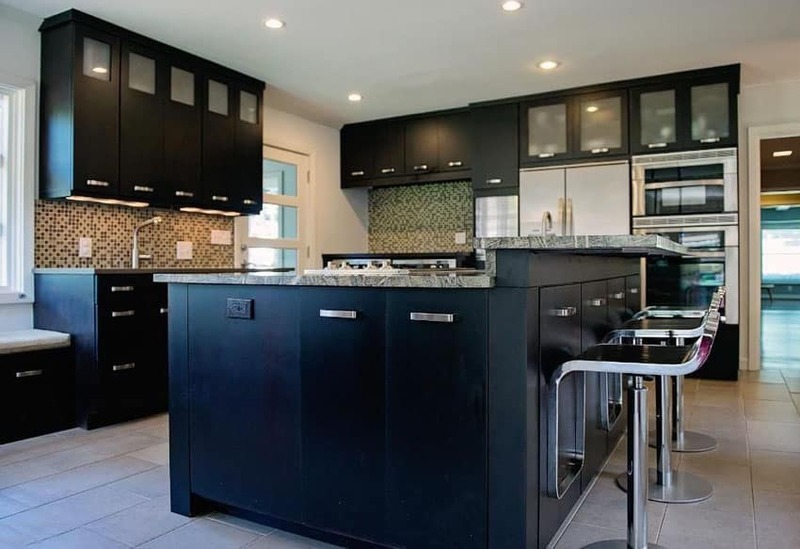 The dark cabinetry is matched with a black soapstone counter on the island and has a wood butcher block countertop on each side of the high end range. 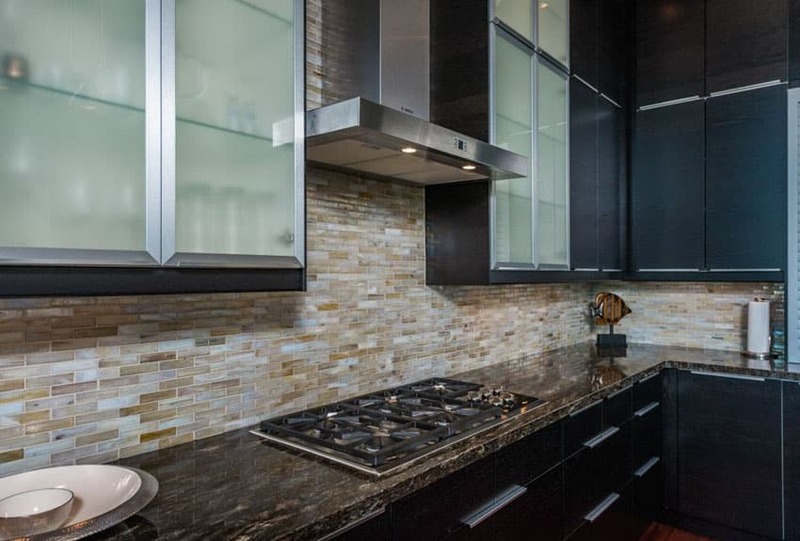 A small brick backsplash is combined with a stainless steel splashboard behind the cooktop that give an industrial vibe. 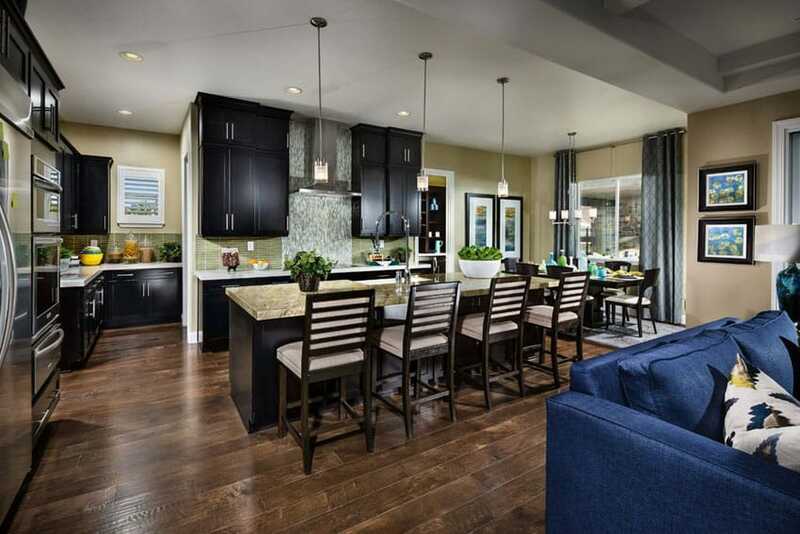 The black speckled polished granite countertops match with the dark paneled wood cabinets and drawers; while the stainless steel appliances and wash basin, and glass pendant lamps over the kitchen island provide Contemporary finishes to the Classic wood and granite combination. The pale white tiled backsplash provides lightness to the mostly dark kitchen, and is emphasized by cove lighting beneath the hanging cabinets. Kitchens with dark cabinets that are offset by white walls and light flooring can help keep the balance right in the room. In the room above the light color linear grained stone floor tiles lead from the dining room to the kitchen. Black hanging cabinets are topped with accents such as plants and white cases, and have hidden pelmet lighting, illuminating the grey marble countertops and white stone backsplash. The kitchen island distinguishes itself from the rest of the kitchen casework with its white wooden base, grey tiled frontage and curvilinear cut countertop slab. White Cattleya orchids provide the perfect dining table centerpiece beneath the Contemporary lampshade pendant lamp. Stainless steel appliances and wash basin further emphasize the Transitional feel of this kitchen space.